If you are looking for a different travel adventure with locals in Korea please find out about joining our free Korean language guided walks. Don’t worry – no language skills required. Jeju Olle Trail is starting free guided walks in English for international walkers. The program is going to begin small and get larger depending on the situation. You’ll be led along the Olle route and see Jeju at a more gentle pace. Every day life will pass you by throughout the day. Walkers will get to see a side of the island that many visitors do not get to see as they are too busy hopping from one tourist attraction to the other. As the program is just getting started the walks will be once-a-week on Wednesday along Route 6. The start time is 9:30 a.m. at Soesokkak Bridge, which is a few hundred meters back up the road from the beach at Soesokkak. The route leads down to Soesokkak with toilet facilities and convenience stores. Those places will be important, especially after a bus ride. However, if you want to participate in the walk you must registered by 5:30 p.m. on the Tuesday evening. You cannot just turn up in the morning and walk with the group. Here are the English guide scheduled dates for spring and summer 2019. Yes, this is correct. We have guided walks in Korean almost every day of the month. Many of our international walkers choose to these, too. This is where the international walker must make a choice: What kind of travel adventure do you want? Do you want the comfort of walking and talking in English with the guide and other international walkers. Or do you want a very Korean day with the locals? Of course there is a language barrier, but that’s the fun part of the traveling adventure. However, there is usually a Korean in the group with an English ability to act as an informal translator. At the moment we offer one walk on Route 6. This route is mainly on asphalt with one hill climb, some ups-and-downs on the coast, and some sections on softer coastal forest trail. There is one point in front of the KAL Hotel that is rocky. However, a detour is offered through the gardens of the hotel if needed. This route is 11 km and if you are in general good health walkers will be fine. 6 year old children have walked this route, too. Don’t worry too much. Depending on the group and weather it might be possible to miss the hill climb. Please see the image below. You can get more information from our free English language guide book. As mentioned above we only offer Route 6 at the moment, and the route length is 11 km. Not too short and not too long. A good introduction to the island and Jeju Olle Trail. If you cannot walk then please send an email to jejuolle@jejuolle.org as a matter of manners and courtesy. The guided walk will not be cancelled under the circumstances of generally poor weather like rain or snow. In case of disastrous weather conditions such as super heavy rain or a typhoon, the office will notify participants via e-mail a day before. Yes, this guided walk is completely free. You should not give a cash donation to the guide. It is not expected or wanted. Therefore just prepare a few snacks and drinks. There are places to refill along the route. However, walkers should pay for lunch. Staff from Jeju Olle Foundation will be guiding and walking with the participants. Each staff member has their own area of trail expertise. 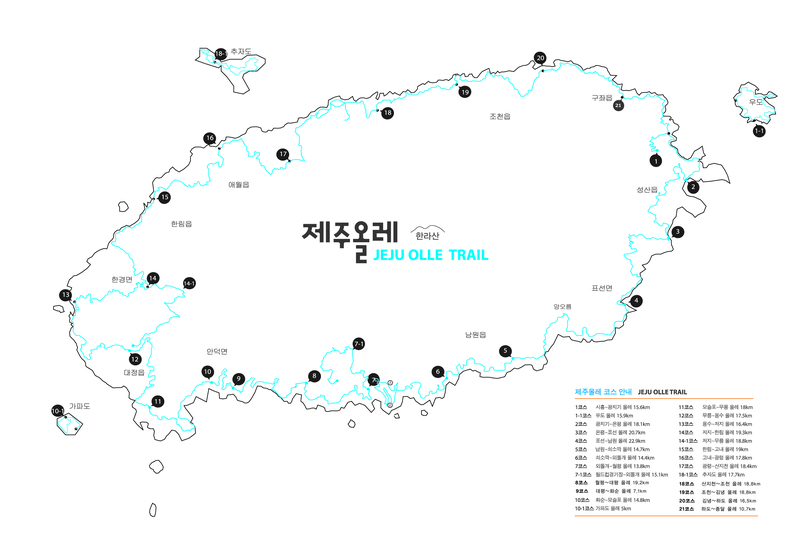 Participants will hear stories about how the trail is put together and operated, the culture and daily lives of Jeju Olle Trail and the island. This might be a worry for some who have traveled around the world and have experience with guided walks – not all guides are created equal. They may speak textbook English or may speak quite broken English. Maybe they can’t go off-script. However, the office staff speak at Jeju Olle Trail speak solid sound English. Walkers should prepare their usual comfortable walking clothes and equipment. Route 6 is not a wild trail at all. It goes along the coast of Jeju through small villages and roads. Prepare a few snacks and drinks. Remember to look at the weather forecast ahead of time. At lunch time, guides will choose local restaurants after listening to participant’s preference. It is very likely that we will have typical Korean food, however, it may depend on which point to have lunch and the taste of participants. For example, the Bomok Port area, will have fish dishes (고등어조림, 성게미역국, 매). But if the group stops for lunch near to the city, there are more variations and options. If you have a special dietary requirement please write that on the registration form. We ask that walkers try to finish the day because it can be difficult to leave in the middle. Others have to wait while the guide takes care of you. So try your best to just enjoy this event for the day. Don’t make reservations or plans for after. Relax and enjoy the day. Walkers will complete the walk at the Jeju Olle Trail HQ and Center. You might even get a tour, too. Why not make a Ganse doll with our experience program. Remember this is another day in your life and another day of travel. Sometimes – for whatever reason – something might go wrong or someone might say something that gets taken the wrong way. Relax, take a deep breathe. Chalk it up to the adventure of travel and try not to get too angry or flustered.